Preheat oven to 375°F. Coat a large baking sheet with cooking spray. In a small bowl, combine sugar and cinnamon. Mix well and set aside. Unroll breadsticks and cut each in half lengthwise (to make a total of 24 pieces). Arrange pieces on prepared baking sheet and coat with butter flavor cooking spray. Sprinkle 1/4 teaspoon of cinnamon-sugar mixture over each piece. 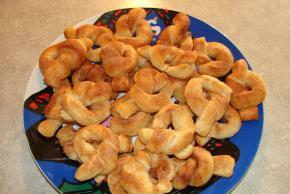 Tie each piece into a knot (pulling dough gentle if necessary). Sprinkle remaining cinnamon-sugar mixture over knots. Bake until puffed up and golden brown, about 15 minutes. Serve warm.